One of my favorite places to eat is a little pizza place by my house called Sazza. Sazza's ingredients are mostly organic and bursting with unique flavor combinations. My favorite salad on the menu is their Sunshine Salad with Creamy Lemon Vinaigrette. I crave this salad on a daily basis so I thought I would try and recreate it at home, and it was a success. Here is to happy and healthy eating! Prepare all of your vegetables. Grill your chicken and set aside to cool. 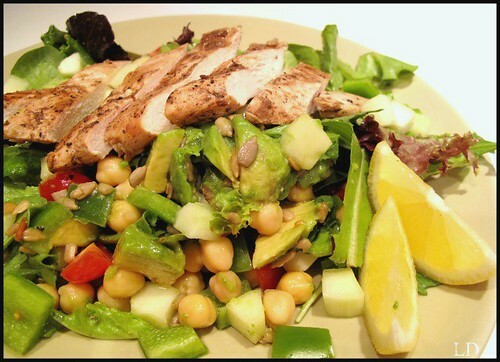 Mix in a large bowl your greens, vegetables, seeds, cheese, and sliced grilled chicken. Top with your creamy lemon vinaigrette, serve. In a small bowl whisk the egg yolk and the lemon juice. Slowly add in the olive oil and cream whisking rapidly. Season with salt and pepper. This sounds delicious Laura, I'm going to ahve to try it!